A first visit to a new office of veterinarians is filled with questions and important information. At Old Dominion Animal Hospital in Charlottesville, we want to make sure all your pet care questions are answered. 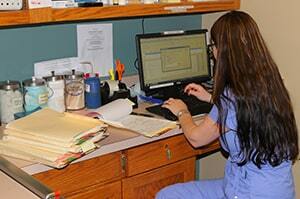 If you are changing veterinarians, be sure to ask your previous veterinarian to send your records to us. We can also contact them, if you like, and have your records faxed to us. For new pet owners, please try to provide any information you have. This includes shots given, medical care received, and spay/neuter history. Having these records available at the time of your appointment is very helpful. This information will help our veterinarians to provide the best care possible for your pets. We have also compiled a few questions that will help us to provide the best care for your pet. These are common questions pet owners ask our veterinarians and that our doctors find themselves asking owners. Print and fill out the Patient Checklist before your first trip to visit our veterinarians to save time and make your visit a little easier. You can save time and make your appointment easier by filling out our New Patient Form . This will also allow our staff to have your files ready for review so that your veterinarian can get familiar with your pet’s history. Click on the New Patient Form Button to register yourself and your pet or pets as a new patient with us. Thank you!